Honing steels are what keep your knives able to make the cut. Wear-and-tear that comes from their daily battles against bones, vegetables, prime cuts of meat, and other components in your favorite meals can leave the edges of your blades worn out and wilted. Despite what door-to-door knife salesman would want you to believe, a knife with a bent edge isn’t ready to be put out to pasture just yet. Instead, honing steel can be used to realign and straighten the edges of world-weary knives, restoring them to their original profile. By employing honing steels on a daily basis, you can keep your knives invigorated and prevent them from succumbing to curled edges. So What is a Honing Steel? You’ve probably seen honing steels lying around the kitchen, faithfully waiting to straighten faltering knife edges. Commonly referred to as sharpening sticks, sharpening rod, chef’s steel, butcher’s steel, or sharpening steels, honing steel typically looks like a rod that’s about a foot long and can be made out of pure steel or have a steel interior coated with either ceramic or diamond particles. However, Green Elephant ceramic rods are made fully out of ceramic. What happens when your blade becomes dull is that it loses its alignment and can no longer function as well as when it was sharp. When using a honing steel to recover that lost sharpness, it essentially works to re-align the blade’s edge without the need to shave much off, as opposed to a sharpening tool which produces a newer and sharper edge through shaving off more bits of the edge. Steel – As the original material from which honing steels were made, it carries with it the sophistication of tradition. 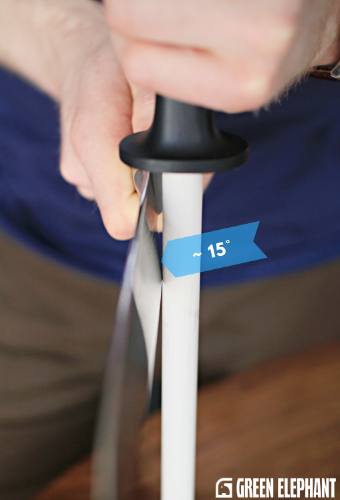 With longitudinal ridges, it re-orients the edge of your knife without scraping off any of the metal. For those not interested in increasing the sharpness of their knife or resuscitating a dull blade, this can be a reliable tool for keeping blades youthful with minimal effort. Some steel varieties will be magnetized to prevent any minute, metal particles from finding their way into your food. Diamond- Despite sounding like an icon of opulence, these honing steels are useful implements around the kitchen. With a coating of diamond dust adding teeth to their humble steel frame, they feature a coarseness that eliminates the need for longitudinal ridges. Blades scraped along diamond-coated honing steel will have a significant amount of metal sheared off, as the roughness of the diamonds wears heavily on the steel of the knife. This can make them a less-than-ideal option for daily honing, as their abrasiveness can end up causing damage to your blade with frequent usage. Another element that makes these types of honing steels the center of controversy amongst blade enthusiasts is the propensity for the diamond coating to wear off after a relatively minimal amount of uses. Ceramic- In the 1980’s, ceramic rods rose to prominence. With their ability to both straighten edges and trim small amounts of metal off of the blade, they allow knife owners to maintain the sharpness of their knives without risking accidentally over-sharpening them. 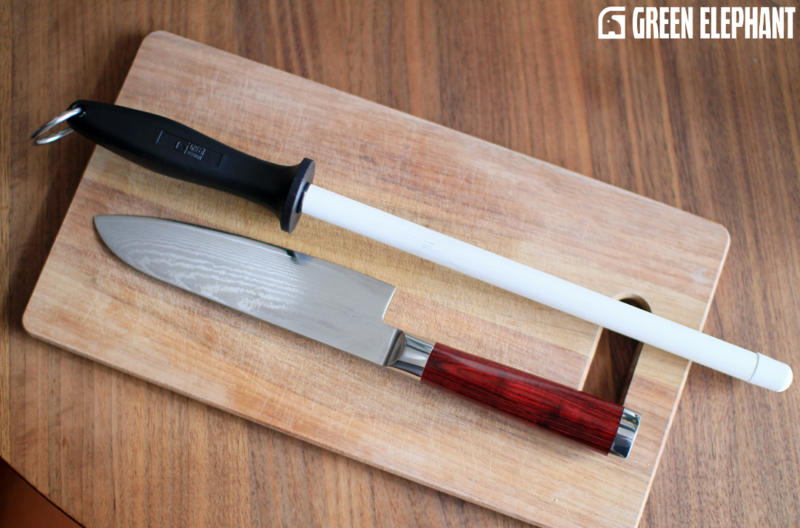 Green Elephant Ceramic sharpening rod has 1500 grit, making them the ideal tool for keeping steel kitchen knives in premium condition. While some users report that the brittleness of the ceramic-coating makes it liable to break easily, Green Elephant fully ceramic honing rods feature a proprietary shock-absorption technology that keeps their survival up and lasting longer than previously possible. As a result, these ceramic honing steels have the longest life spans in the industry and ensure that your knives last equally as long. Before jumping into the nitty-gritty of the technique of using honing steels, check out the infographic below to understand a little bit more about the hardness of different steels used in kitchen knives today and what role does the HRC play in choosing the right honing steel. There are plenty of misconceptions about how to correctly use a ceramic honing steel, but fortunately, we’re here to set the record (and your knives’ edges) straight. Usage of a ceramic honing steel is easy and effective, but it must be done correctly for the desired results to occur. It’s important that during honing, the hone is stroked with the knife angled at the same angle that it was sharpened during the manufacturing process. Though some German manufacturers, such as Wusthof and Henckels, have started to experiment with sharpening edges to 14-15 degrees on each side, unless your knife’s maker has stated otherwise, it’s a safe bet your knife has come from the factory with 20-degree edges. Making sure to grip the hone with your non-dominant hand (so, for our right-handed readers, the left hand would hold the hone, and vice-versa), press it perpendicularly against a cutting board or some other type of buffer with which to protect your countertops. Next, it’s important to determine the correct angle at which your blade will be stroking the hone. There is a simple and effective cheat for finding the desired angle: Press your knife’s blades perpendicularly into the hone, as if your objective was to cut it in half (make sure, however, not to do this, as it significantly reduces the effectiveness of your hone). With the blade against the hone, notice that 90-degree angle is formed. By rotating the blade upwards towards the midpoint of that right angle, you’ll have found the 45-degree mark. From there, it takes angling the blade to the midpoint of the 45-degree angle to find the sought-after, 22-degree sweets spot. This is the angle at which you will stroke the hone at with your knife for most German knives. Placing your knife at the correct angle, touch the heel of the knife (or the part of it that’s closest to the handle) against the part of the hone furthest from the cutting board. Slowly let the blade make its way down the hone away from you. Upon reaching the bottom, the tip of the knife should be making contact with the ceramic honing steel. *One important thing to note is that your tip should never slide off of the hone, as it can lead to unwanted rounding. Make sure not to press very hard, as minimal amounts of pressure are necessary to get the ideal hone. In fact, one simple way to ensure that you haven’t used more force than required is to let the weight of the knife control the pressure. Once you’ve completed one side, move to the opposite side of the hone for the other side of the knife. Do not be afraid to go slowly and methodically at first. 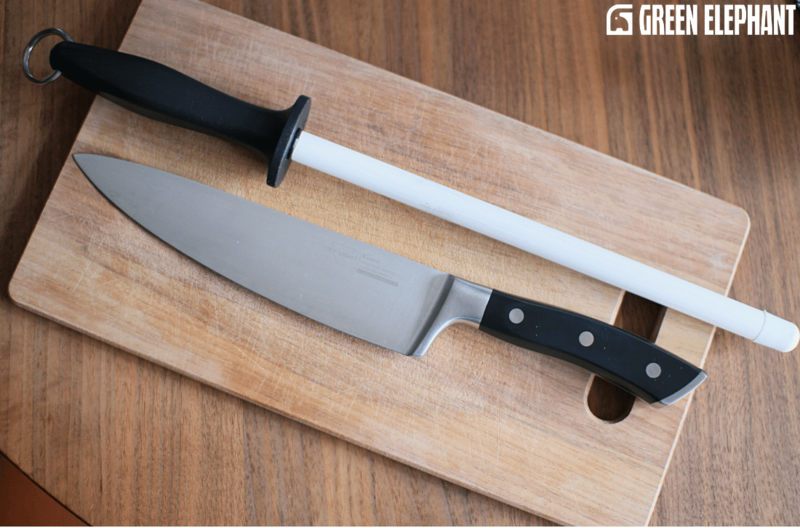 Keep in mind that the number of strokes required depends on how dull your knife is. 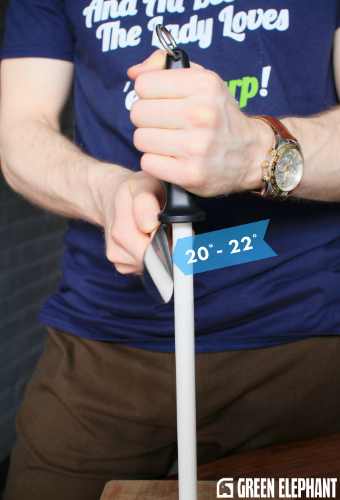 If you hone your blade regularly, alternating your strokes on each side about 5-10 times should do the trick. If you have a very dull blade that is not regularly honed, it could take more strokes to restore the bent and damaged edge. What happens if your blade doesn’t seem to improve or is still noticeably dull after multiple strokes? The answer may lie in your angles. Verify that the angle you are using is the same as at which the knife was originally sharpened. Another contributing factor could be how much pressure is being applied. While honing is a low-pressure system, if you find you’re not achieving the intended level of sharpness despite stroking the hone at the correct angle, then very gently start increasing the amount of pressure applied, which could solve your problem! Known for their precision and grace as they maneuver their way through raw foods, Japanese knives owe their sharpness to harder steel and more acute angles for their edges. Though every knife has its distinguishing hallmarks, in general, Japanese knives require the same honing process as their western counterparts, with the principle difference being the angle at which the blade must strike the hone. Tilts of 15 degrees produce optimal results for Japanese knives and guarantee that your knife will continue cutting through fish, vegetables, and more for nights filled with food from the Land of the Rising Sun. During the process of field dressing game, hunting knives strike up against bones, tough hides, and other formidable challenges that can leave your hunting knife’s blade worse-for-wear. However, just because your blade gets damaged preparing game meat, this doesn’t mean you have to buy a new knife after a few hunts. In honing, angles are everything! At too acute of an angle, the cutting edge doesn’t make enough contact with the hone to remove the necessary amounts of steel. Though the frame of your blade will be up against the hone, the actual edge will find itself taunted by a hone which it cannot access on account of a multi-millimeter chasm. Conversely, having the blade directly on the hone will actually blunt it. It cannot be emphasized enough: Running the blade perpendicular to the hone is not the sharpest idea! Whether you’re a home cook that needs to keep your knives in optimum condition with weekly honing, or you’re the chef at a Michelin-rated restaurant who needs to realign your blades on a daily basis, hopefully you now have a better understanding of what honing steels are and how they can help keep your tools sharp.